Hello particle gobblers and happy new year from my new location at the University of Granada. In between presents and feasting, you may have heard rumblings over the holidays that the LHC could be seeing hints of a new and very massive particle. 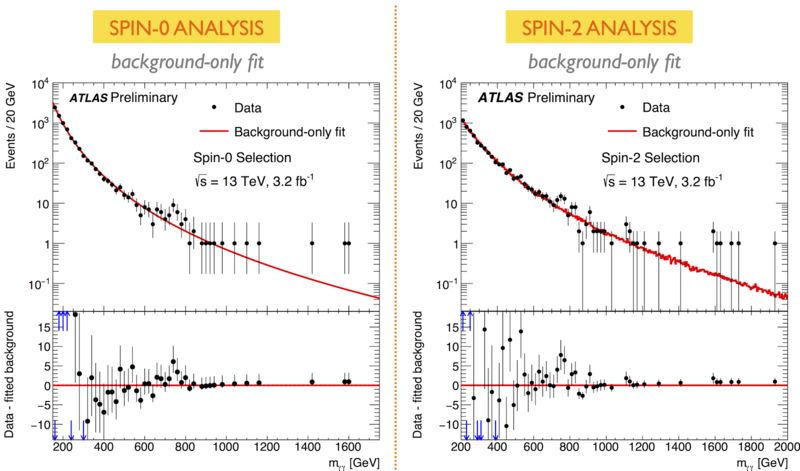 The rumors began even before the ATLAS and CMS experiments announced results from analyzing the brand new 13 TeV (in particle physics units!) data which was collected in 2015. At 13 TeV we are now probing higher energy scales of nature than ever before. These are truly uncharted waters where high energy physicists basically have no idea what to expect. So there was a lot of anticipation for the first release of new data from the LHC in early December and it appears a tantalizing hint of new physics may have been left there dangling for us, like a just out of reach Christmas cookie. 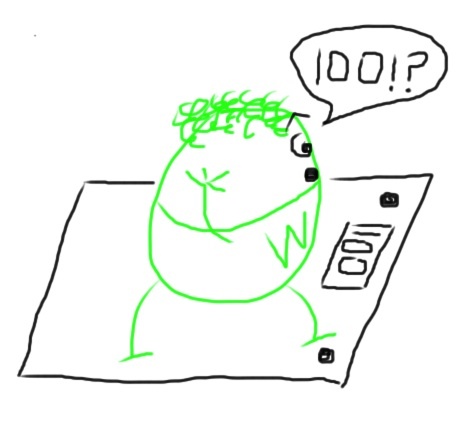 Since the announcement, a feeding frenzy of theoretical work has ensued as theorists, drunk from the possibilities of new physics and too much holiday food, race to put forth their favorite (or any) explanation (including yours truly I must confess:/). 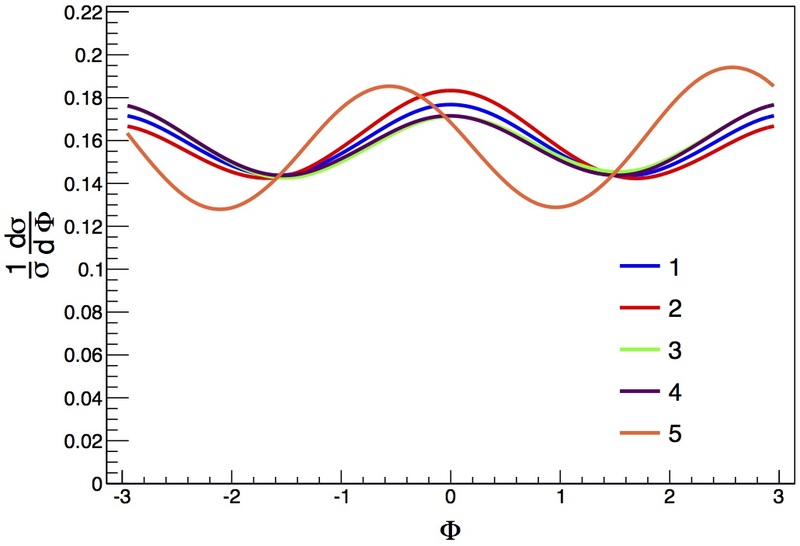 The reason for such excitement is an apparent excess seen by both CMS and ATLAS of events in which two very energetic photons (particles of light) are observed in tandem. 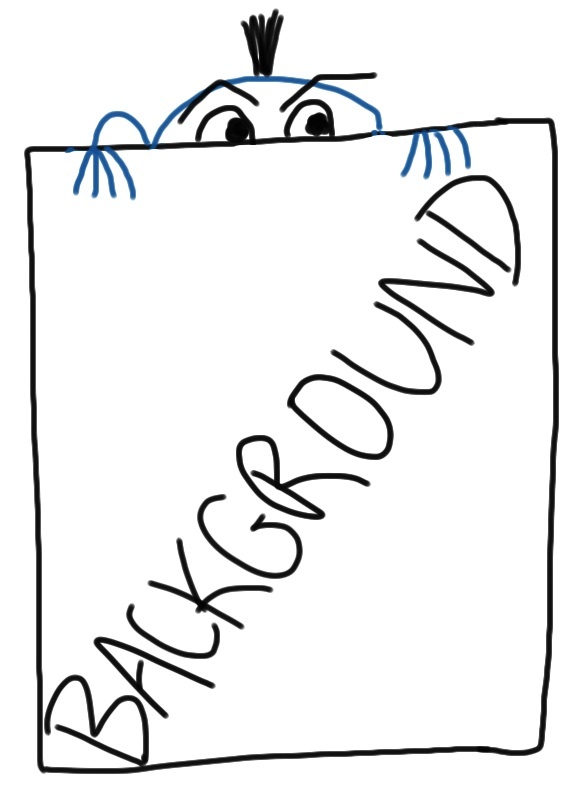 By `excess’ I basically mean a `bump‘ on what should be a `smooth‘ background exactly as discussed previously for the Higgs boson at 125 GeV. 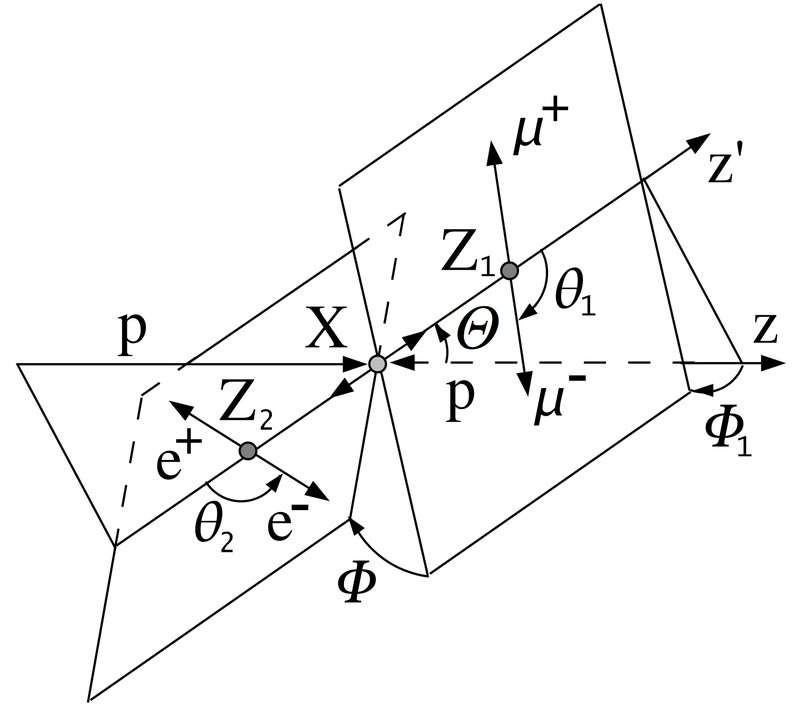 This can be seen in the CMS (Figure 1) and ATLAS (Figure 2) results for the observed number of events involving pairs of photons versus the sum of their energies. 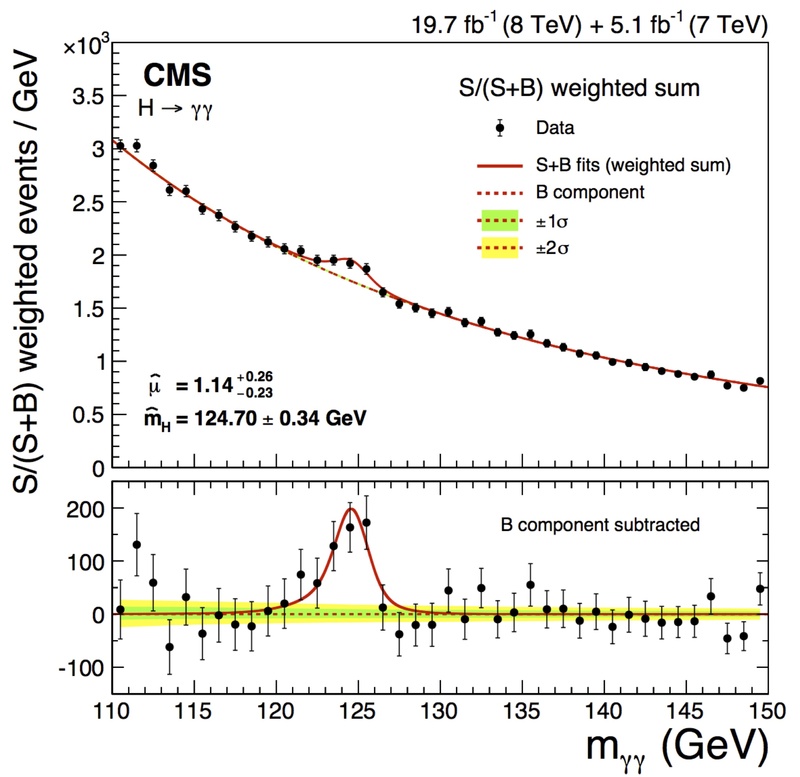 Figure 1: CMS results for searches of pairs of photons at 13 TeV. 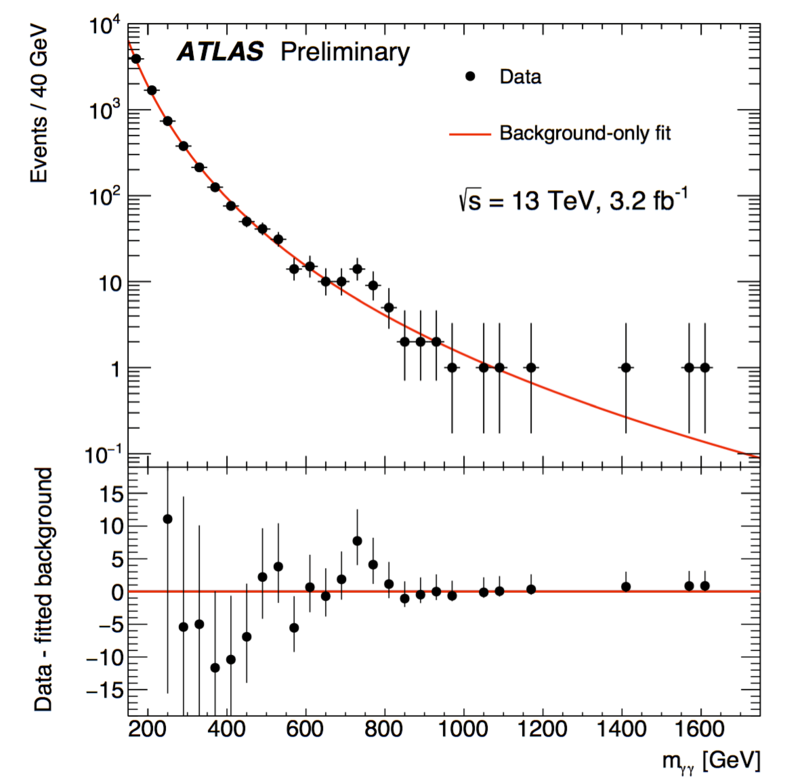 Figure 2: ATLAS results for searches of pairs of photons at 13 TeV. 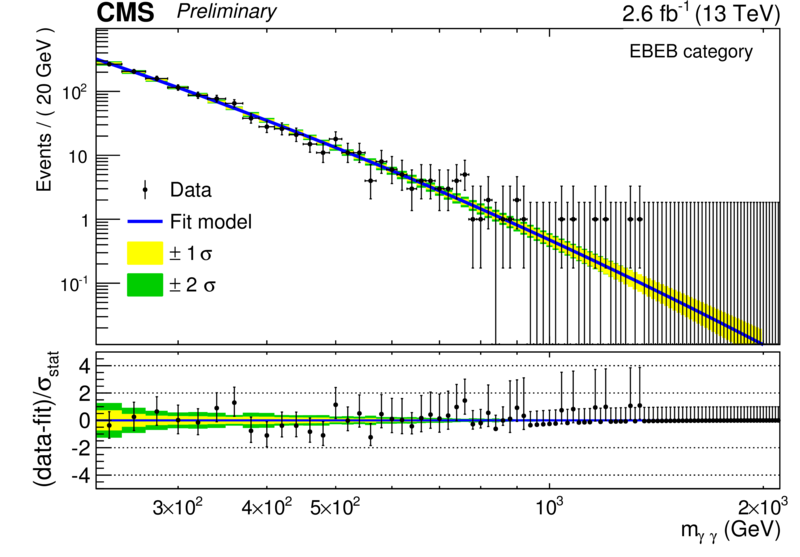 The bump in the ATLAS plot is easier to see (and not coincidentally has a higher statistical significance) than the CMS bump which is somewhat smaller. What has physicists excited is that these bumps appear to be at the same place at around 750 GeV . This means two independent data sets both show (small) excesses in the same location making it less likely to be simply a statistical fluctuation. Conservation of energy and momentum tells us that the bump should correspond to the mass of a new particle decaying to two photons. 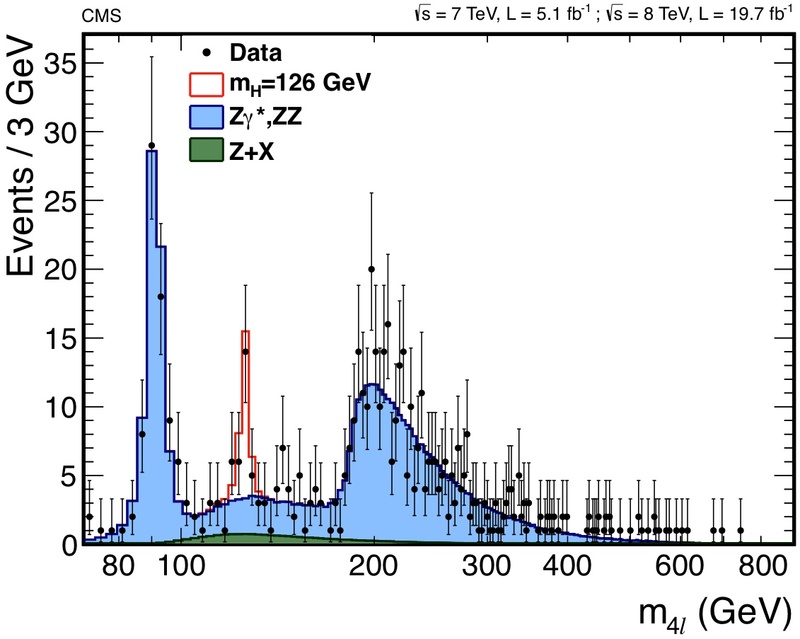 At 750 GeV this mass would be much higher than the mass of the heaviest known particle in the Standard Model; the top quark, which is around 174 GeV while the Higgs boson you will remember is about 125 GeV. 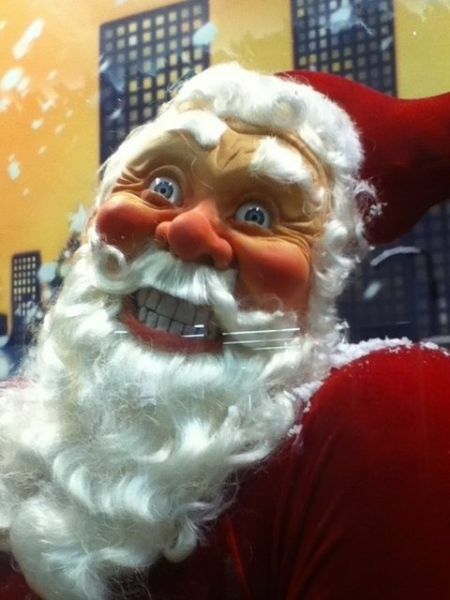 It is of course statistically very possible (some might say probable) that these are just random fluctuations of the data conspiring to torture us over the holidays. 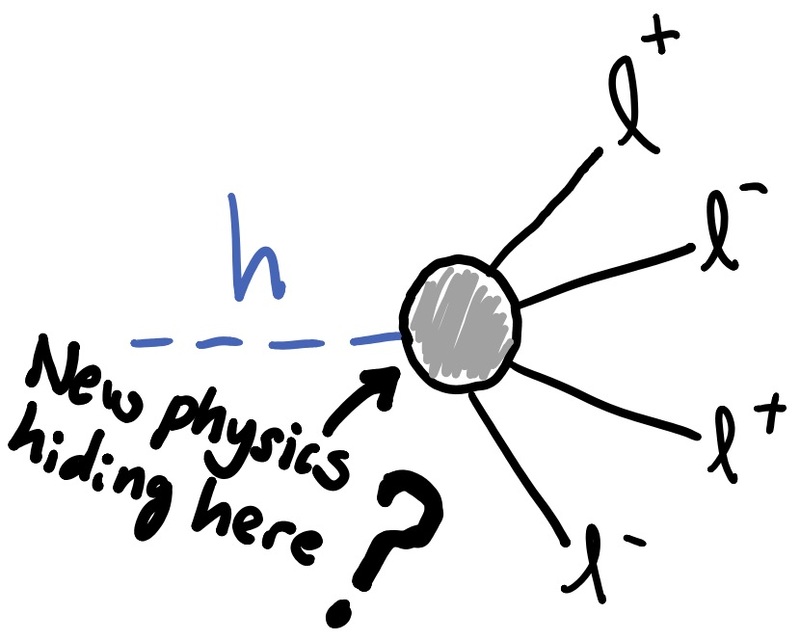 Should the excess persist and grow however, this would be the first clear sign of physics beyond the Standard Model and the implications would be both staggering and overwhelming. Simply put, the number of possibilities of what it could be are countless as evidenced by the downpour of papers which came out just in the past two weeks and still coming out daily. 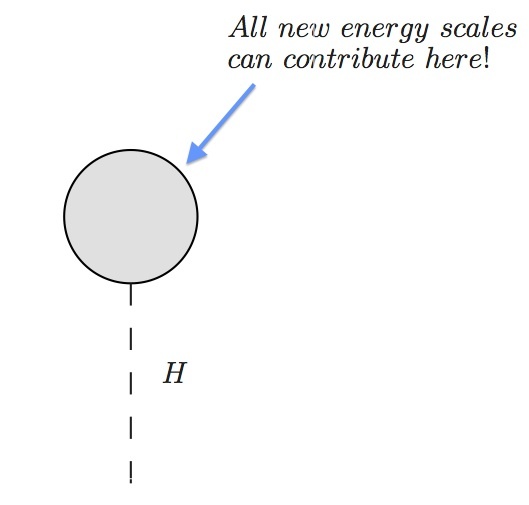 A simple and generic explanation which has been proposed by many theorists is that the excess indicates the presence of a new, electrically neutral, spin-0 scalar boson (call it ) which is produced from the fusion of two gluons and which then decays to two photons (see Figure 3) very much like our earlier discussion of the Higgs boson. 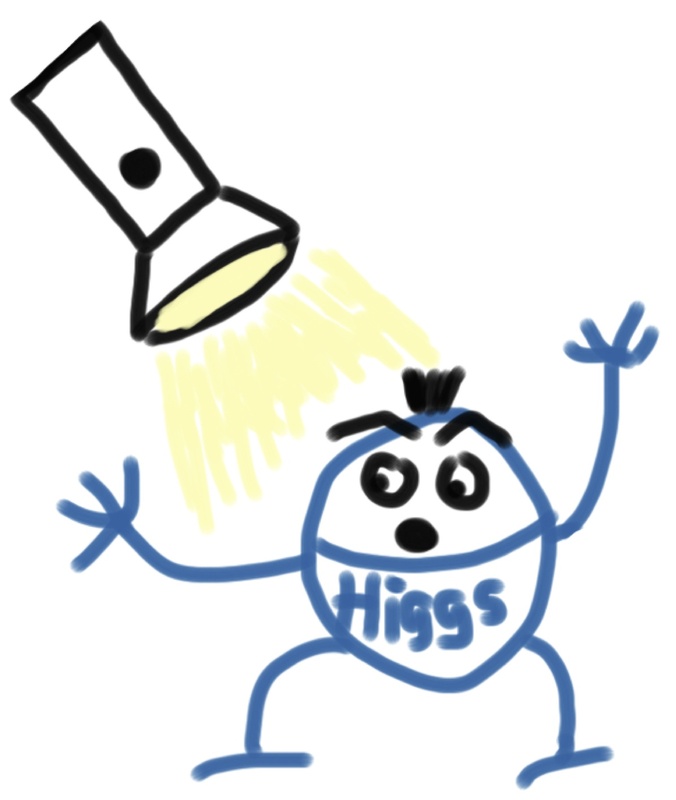 So at first appearance this just looks like a heavy version of the Higgs boson discovered at 125 GeV. Crucially however, the new potential scalar at 750 GeV has nothing (or atleast very little) to do with generating mass for the W and Z bosons of the Standard Model which is the role of the Higgs boson. 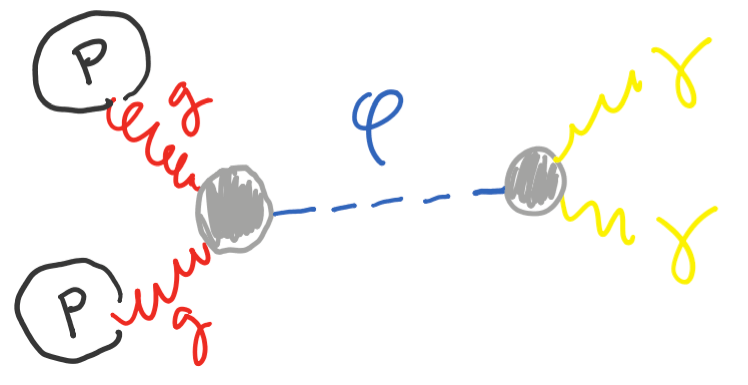 I will save details about the many possibilities for a future post , but essentially the many models put forth attempt to explain what occurs inside the gray `blobs’ in order to generate an interaction between with gluons and photons. Figure 3: Production of a new scalar particle via gluon fusion followed by decay into photons. 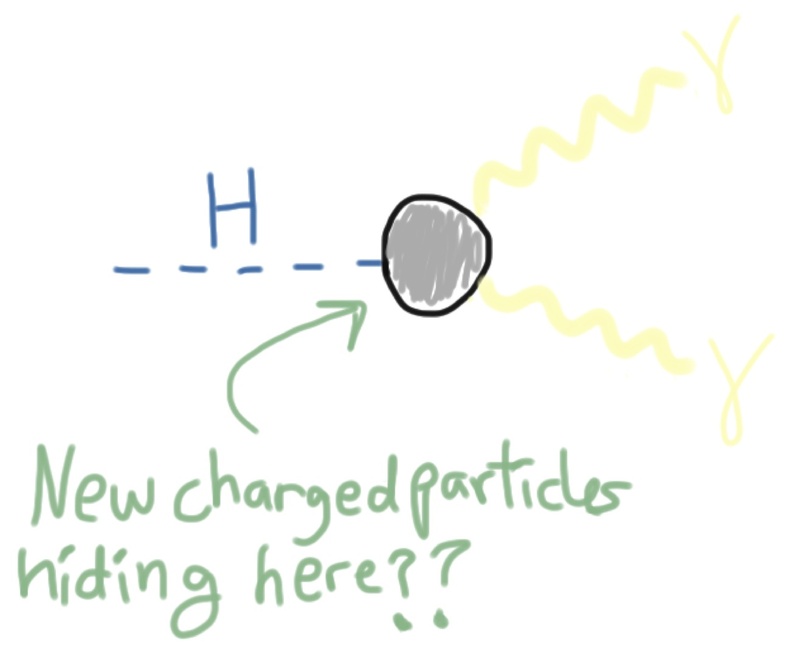 It will of course take more data to confirm or deny the excess and the possible existence of a new particle. Furthermore, if the excess is real and there is indeed a new scalar particle at 750 GeV, a host of other new signals are expected in the near future. As more data is collected in the next year the answers to these questions will begin to emerge. In the meantime, theorists will daydream of the possibilities hoping that this holiday gift was not just a sick joke perpetrated by Santa. 1. It is a bit difficult to tell by eye because the ATLAS plot axis is linear while that for CMS is logarithmic. A nice discussion of the two bumps and their location can be found here. 2. For those feeling more brave, a great discussion about the excess and its implications can be found here and here.